Due to the vast popularity of TV detective and crime shows, many people associate detectives with murder and assault investigations. 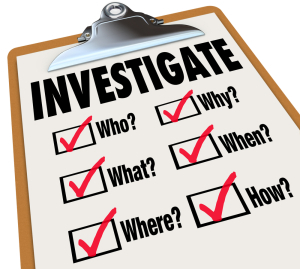 However, while detectives can play a major role in these types of investigations, they provide a wide range of services. A PI can resolve missing persons cases, provide domestic and corporate surveillance, administer background checks, and investigate financial fraud. A private detective can conduct a background check to shine a light on a person’s professional and personal history. With a background check, corporations can find out if a prospective employee has a criminal record and see if the person is a good fit for the company. Private individuals can hire PIs for background checks of their child’s babysitter or a new romantic partner to ensure the safety of themselves and their child. The information gathered from a background check can also be used in court. PIs conduct surveillance and gather evidence anonymously and confidentially. Domestic surveillance can be used to find out if a spouse is cheating or abusing or neglecting a child. This information can be used in a divorce, child custody or child abuse case. Surveillance can also be used to investigate housekeeper or roommate theft, identity theft, elderly and disabled caregiver activities, or a runaway child. For corporations, surveillance can help detect and deter threats and thefts, as well as determine if an employee receiving workers’ compensation is not faking an injury. PIs play a major role in missing persons cases and can help you locate a lost relative, witness, suspect or any person of interest. Whether a loved one has gone missing or you are trying to track down a criminal that is vital to your case, a PI will work tirelessly to ensure the person is found. Businesses can hire a private detective to determine if someone if committing financial fraud. Whether you have been a victim of fraud or suspect something shady is going on with your business’s finances, a PI can get you the answers you need to move forward. Our private investigator agency in NYC provides all of these services and many more. If you need a private investigator to locate a missing person, provide background checks and surveillance, or investigate fraud, contact our detective agency today.